ASUS Prime 300 Series motherboards provide the solid foundation needed for your first build, plus flexibility to grow with your ambitions. We’ve melded all the good stuff that’s packed into the latest 8th Generation Intel® Core™ processors with essential ASUS design and engineering, so you benefit from industry-leading technologies – including automated system tuning, comprehensive cooling controls, and immersive onboard audio. When you build with an ASUS Prime 300 Series motherboard, you build smart, easy and affordably. ASUS OptiMem preserves memory signal integrity by routing traces and vias to the optimal PCB layer, and our T-Topology trace layout ensures time-aligned signaling by balancing trace lengths between memory slots. These enhancements allow the Prime 300 Series to support a wide range of dual and quad-DIMM memory kits, while providing your rig with the stability it needs to deal with any type of workload – whether you’re gaming or running intensive applications. ASUS is the world’s leading motherboard brand. 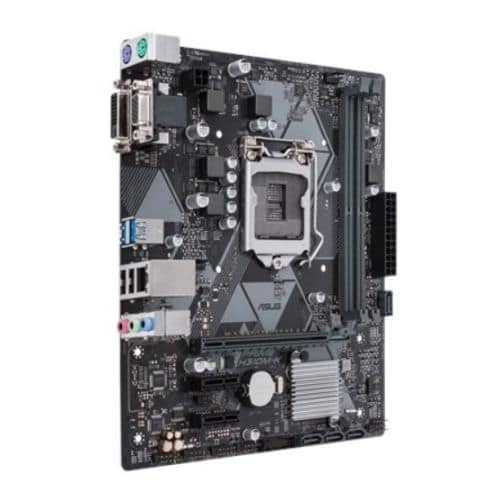 Our motherboards are extensively tested for compatibility with more than 1,000 components and devices, and each new model undergoes a minimum of 8,000 hours of strict validation – offering the peace of mind of knowing that your ASUS motherboard is fit for all environments and applications. Choosing ASUS is an assurance of trouble-free DIY experiences. Prime 300 Series motherboards are engineered with industry-leading 5X Protection III, employing the finest components, excellent circuit design and exacting standards to guarantee the quality and long-term durability of your investment. That means exceptional protection and stability for your build – thanks to decades of engineering experience from the world’s leading motherboard brand. The superior compatibility of Prime 300 Series is evidenced by our extensive list of supported devices – which includes thousands of compatible components – and our Qualified Vendor List (QVL) that identifies memory compatibility. It all adds up to more choices for worry-free PC-building experiences. Separates analogue/digital signal domains, significantly reducing multi-lateral interference. Prime 300 series isn’t just VR ready – it goes way beyond. The ASUS Beyond VR Ready marque means that Prime 300 series has been tested with loads of class-leading components to ensure that your productivity, gaming and entertainment needs are tuned for maximum performance. ASUS Beyond VR Ready opens up a new way to configure and build your dream system with total confidence. The Intel® H310 is a single-chipset design that supports 8th Generation Intel® Core™ LGA1151 processors. It provides improved performance by utilising serial point-to-point links, allowing increased bandwidth and stability. Additionally, the H310 chipset provides a maximum of four USB 3.1 Gen 1 ports, four SATA 6Gbps ports, and 10Gbps M.2 and PCIe 2.0 lane-speed support, for faster data retrieval. Intel H310 also supports integrated-graphics, so you’ll enjoy the very latest in graphics performance.